The day started out simple enough. 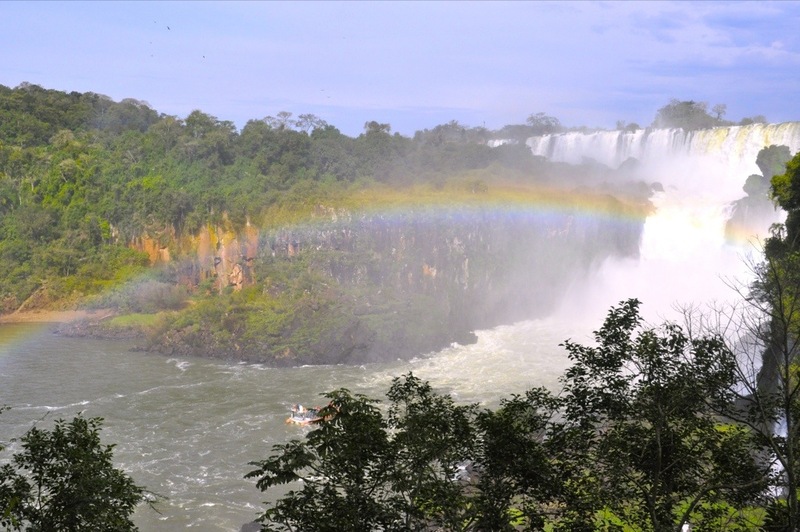 As I mentioned in my blog yesterday, our plan today was to visit the Argentina side of Iguacu Falls (or Iguazu Falls, if you’re in Argentina). Luri, our host, offered to set up a cab ride across the border and directly to the Argentine national park for a really reasonable rate. So we decided to go for it. Dani then proceeds to make a phone call. She talks to the person on the other end, hangs up, and then says, “Police Greve”. “Argentine police or Brazil police?” I ask. Uh oh, we all think, this is going to be anything but “gravy”. The border crossing has been taken over by the federal police, guys with shot guns. Traffic is now at an absolute standstill. 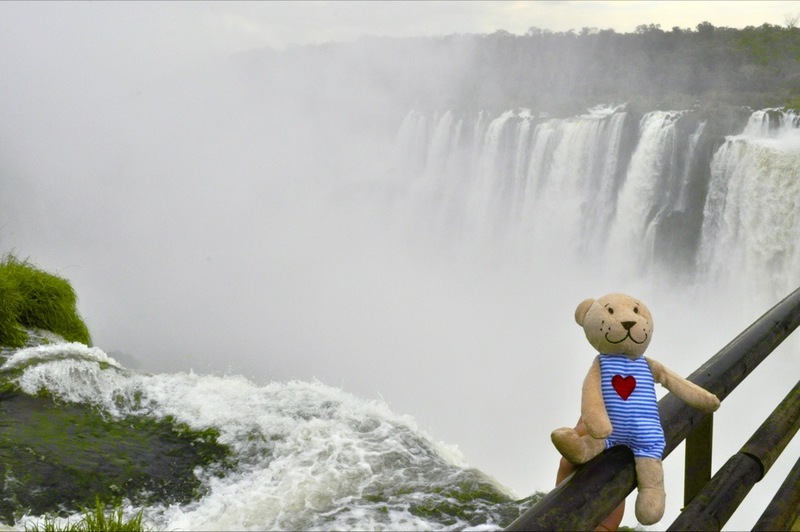 Therefore, our cab driver tells us that the only way to go to the Argentine side of the falls is to leave the cab, walk across the border, and take a bus to the falls. Still unsettled about the fact that the police are on strike, my first inclination was to return back to our casa, however the Chinese side got the better of me. After all, we had just exchanged our money into Argentine pesos, and we wanted to go to Argentina to spend them! Also, what else were we going to do today? We might as well try to make our way across the border. So we joined the long line of people going through the Brazil side of immigration. While waiting in this hour-plus line, we met a nice guy who actually ended up being from North Beach in San Francisco! All of us bonded over our love for Chubby Noodle (the pop-up restaurant inside Amante in NB). The funny thing is that he was trying to enter Brazil and we were trying to leave Brazil, yet we were both correctly in the same line! It shows how interesting things work here. After enduring that ordeal crossing the Brazilian side, we proceeded to board a bus to Puerto Iguazu, the town in Argentina closest to the falls. However, 5 minutes after boarding the bus, we stopped at another immigration station, this time on the Argentina side. Thankfully, this one went a lot smoother and quicker. About 15 minutes later, we arrived at the Puerto Iguazu bus terminal and then caught another 30 minute bus to Iguazu Falls. THREE hours after leaving our casa, we were finally at the falls. After doing that hike, we took a mini-tram to another area of the park, which included a walk to the Garganta del Diablo, or the Devil’s Throat. Brazil has their version, and this was the Argentine version. 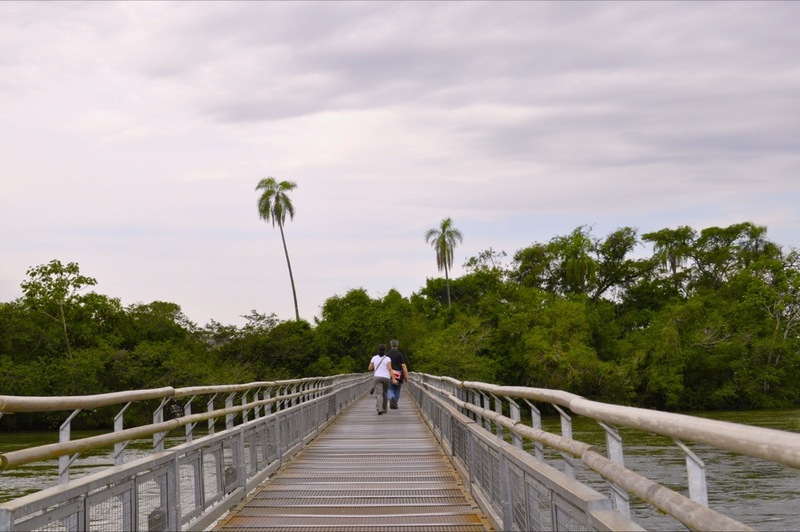 These walkways took us across large rivers (don’t look down!) with some mini-islands in between. Plenty of butterflies and even an alligator were found along the way. 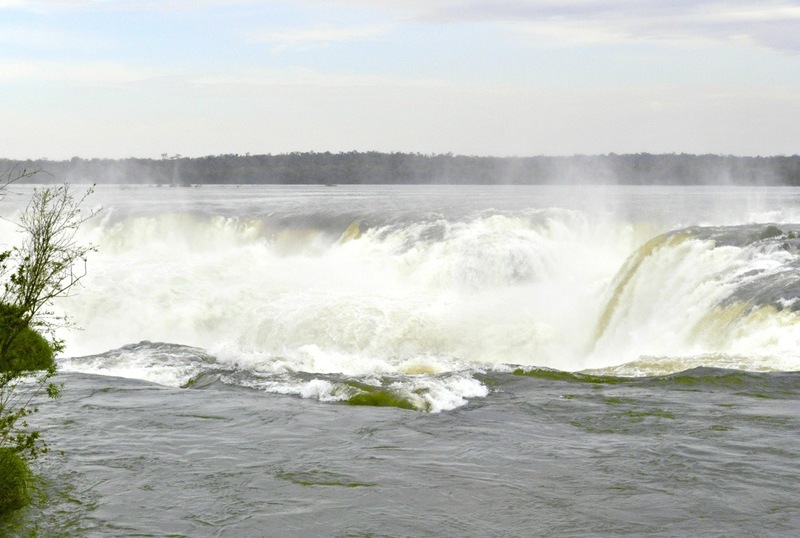 Finally, we arrived at the “Devil’s Throat” itself, walkways over thunderous, swirling, turbulent waters which form part of the Iguazu Falls. 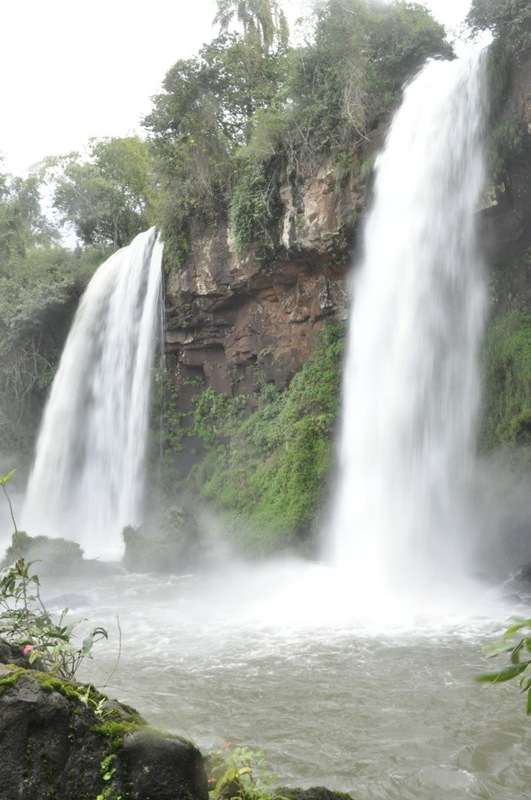 Not only did we get closer to the waterfalls here, we also got a lot wetter! At one point, I was standing with the “Devil’s Throat” to my back so that my dad could take a photo, and a huge spray of water got me in the back. I say a “spray” but it really felt like a bucket! There’s nothing like standing in front of a massive waterfall to make one feel so small. What a unique experience! 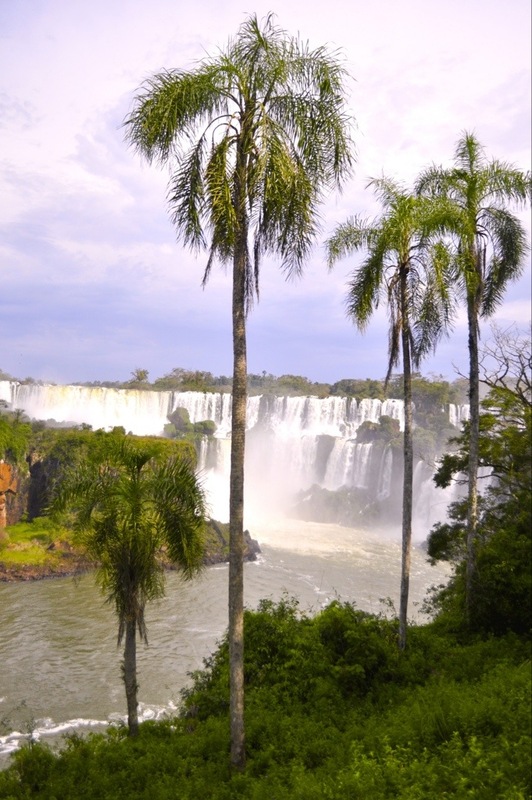 The rest of our day was thankfully uneventful … tram back to the entrance of the Park –> bus back to the Puerto Iguazu bus terminal –> bus to Brazil –> Argentina & Brazil border crossings again –> back on the bus to Foz do Iguacu in Brazil –> taxi to our Casa. Whew! What a day! So much excitement. So much water. Looks like fun. Saw Camille today at pio school lunch. He’s holding up and says he has tons of food. He fell asleep twice while studying. Well, I’m glad my little French bro is being taken care of. And it sounds like the luncheon went well! I totally agree. The unexpected always happens on vacay. I’m just happy we were able to make it and return in one piece. The Falls were absolutely worth it. It can make a photographer out of anyone – I think it’s impossible to take a bad photo there!